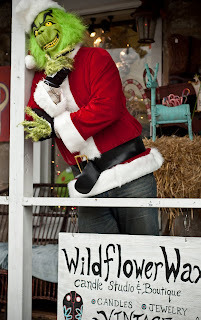 Wildflower Wax Candle Studio: Beware, Grinch Spottings In Helena!!! how fantastic and fun! Wonder what time he might be found tomorrow? Word is...he will be there from 10:00 to 5:00. He claims to love the coffee at La Reunion and all the food at the Monkey Basket, he say's the candle's at Wildflower Wax smell like stench,of course he loathes stench,so he alway's grabs a few!!! Thank you so much for letting Grayson visit the Grinch Friday afternoon! 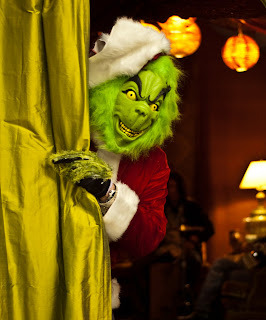 I know it wasn't the best time for the Grinch to have visitors, but Grayson has told everyone about getting to see him! His version of the meeting has been quite funny! The earrings are great and I think my sister in law will love them! I plan on coming back and getting a pair for myself! Thank you again! I love the store! Thank you so much for letting Grayson visit the Grinch Friday afternoon! I know it wasn't the most convient time for the Grinch to have visitors, but Grayson has told everyone about getting to see him! His version of the meeting has been quite funny! The earrings are great and I think my sister in law will love them! I plan on coming back and getting a pair for myself! Thank you again! I love the store!